By R. W. Eugene B. Brown. Read at the Fiftieth Anniversary of Upton Lodge, June 7, 1919. Berkshire, the western county of Massachusetts, is perhaps more intimately connected with New York State and New York City than with Massachusetts and Boston. Berkshire is west of the Hoosac range of mountains and this northern part is in the Hudson Valley. Berkshire, however, was settled by the descendants of the Puritans and not by the Dutch of New York. A research of the early grants of land to the first settlers is very interesting and reveals many controversies. There were grants of townships which either overlapped each other or left spaces between which later led to contentions. These spaces were called "gores," and some of them have continued to the present time. The sections first settled in America necessarily were the sea coasts; then, naturally, followed the river valleys and lastly the mountain regions. Thus the Connecticut and Hudson valleys, both parallel to the Berkshire Valley in the mountains, were settled many years before this section of the country. In fact, it is hard to comprehend now what the early settlers could have seen to covet, for it must be remembered that this whole region, with slight exceptions, was covered with a dense forest; in these dense forests where the sun at its meridian height could not dart its rays through the foliage of the primeval trees to the damp earth beneath. Today we look about us and we see meadows and cultivated fields and lawns, and we say, "This is indeed God's country." The Berkshire Hills are known to every state in the union for their beauty. No such sight greeted the eye of the settler. He could hardly discern the top of old Greylock on account of the density of the forest. And further, the aesthetic side could hardly have appealed to him, for dire necessity faced him. In fact it is hard to understand how trees could be felled, a clearing made, and produce enough harvested the first season to sustain the settler through the following winter. Certainly these must have been rugged, sturdy men, actuated by a high moral purpose. We of this day and generation should realize what they endured and that we are enjoying the fruits of their labors. The first settlement made was in what was then called New Providence Grant, in the east part of what is now Cheshire, known as Stafford Hill, by Joab Stafford. He and nearly all of the first settlers came from Coventry and other sections of Rhode Island. The second deed of land, next to that of Joab Stafford, was that of John Bucklin, an ancestor of mine on my mother's side. Within a few years Stafford Hill came to be a very prosperous village. There was a large hotel kept by Colonel Remington, the first Master of [http://www.masonicgenealogy.com/MediaWiki/index.php?title=Franklin1 Franklin Lodge, and there were stores, a cabinet shop, blacksmith shop, and several other smaller business places, such as are usually found in New England country villages. Governor Long said of it that it was the only deserted village in Massachusetts. Not a vestige remains today to mark the location of this once prosperous village. I have with me tonight the certified copy of the Charter of Franklin Lodge, dated June 9, 1794, signed by John Cutler, Grand Master; Mungo Mackay, Senior Grand Warden; Samuel Parkman, Junior Warden, and Thomas Allen, Secretary. This book also contains the Constitution signed by the officers and members, one hundred and sixty in number. Many names of old families not only in Cheshire, but in Adams, North Adams, Lanesboro, New Ashford, Pittsfield, and some other adjoining townships will be recognized. "At a meeting of the Grand Lodge held at Bunch of Grapes Tavern, Boston, Mass., July 23, 1785, a petition from a number of Brethren viz. :— Daniel Noble and others, praying for a charter to erect a Lodge in Williamstown, by name of Friendship Lodge was received. The same was read and voted: That the petition be granted and that Israel Jones be appointed Master." I find Friendship Lodge, of Williamstown, represented by officers sitting in Grand Lodge in 1786, 1789, and 1794. Franklin Lodge was given a dispensation at one time to hold its meetings alternately in Cheshire and Lanesboro. There seems to be no doubt that meetings were held in Cheshire village, also in Adams, South Village, the latter especially during the last of its existence, but there is no record of any authority to hold its meetings at any places other than on Stafford Hill and in Lanesboro. Further, it has been claimed that New Providence Grant was at one time attached to Adams; but it was not, and furthermore, the town of Cheshire was incorporated in 1793 and Franklin Lodge was not chartered until 1794. Franklin Lodge, therefore, was entirely a Cheshire institution and was never regularly or legally transferred elsewhere. This book of the attested copy of the Charter was found by Stoel E. Dean, and given by him to Frank M. Leonard, who in turn gave it to Daniel Upton. Daniel Upton presented it to Berkshire Lodge, December 5, 1898, in whose care it has been since. I would like to say to Berkshire Lodge that if at any time they will return this sacred relic to its original township of Cheshire I will guarantee that Upton Lodge will guard and safely protect it. In studying these records and considering the very large membership of Franklin Lodge I have been led to wonder how it arrived at such a state of prosperity. Wor. Bro. Edgar W. Chase can tell you of the accounts given him by his grandmother of the gatherings on Stafford Hill, of the many horseback riders who "put up" at the Remington, Mason, and Smith hotels for the night on the first Mondays after the full of the moon, of the big tallow candles made in the big kitchen of the Remington for the Lodge meetings, and of the sumptuous repasts served. There were the best of cooks in those days, as I myself can testify. Not even my wife or my mother ever could make such custard pies, though they made them two inches deep, as did my grandmother in my boyhood days, who was the daughter of David Smith who kept one of the taverns. Lodge meetings in those days meant something when it was necessary to ride on horseback from Williamstown, Hancock, New Ashford, Lanesboro, Pittsfield, Windsor, Savoy, Peru, Cummington, and New Lebanon, over all these Berkshire Hills, through sunshine and rain, over roads which were hardly better than trails, always, however, by the light of the full moon. I have been led to think also of the religious doctrine taught in those days by Elder Peter Worden, Elder Bloss, and other orthodox pastors, of the hell fire and eternal damnation pictured in the pulpits of those days, and I have wondered if it wasn't a relief to get into a Masonic lodge and experience something of the Trust in God and the Brotherhood of Man," which means, if it means anything, that we always have been in His care, are now, and always will be. Franklin Lodge is the parent lodge of all Northern Berkshire. Dr. William H. Tyler, of Franklin Lodge, was chiefly instrumental in organizing Mystic Lodge of Lanesboro, obtained its Charter, wrote its By-Laws, and was the first Master. He and several others, eight, I think, members of the Franklin Lodge, petitioned for the Charter of Lafayette. Lafayette preserves a much-prized letter from him, and I have requested their Wor. Master to bring it tonight and I will ask him to read it. From Mystic we have Globe of Hinsdale and Unity of Dalton, while from Lafayette we have Berkshire and Upton, Williams and Greylock. I would like to insert an incident with reference to Berkshire Lodge. This diploma and this apron — which by the way are the only document and relic of Friendship Lodge in existence, the Grand Lodge records even having been destroyed — were found by my father in an old leather-covered trunk in the attic of the old farmhouse at Bowen 's Corners when he was a boy. There was a Trestle Board or something of the kind with the diploma and apron, and he read it and reread it until he had committed enough of it to memory so that when he was taking his first obligation he prompted the Master when he hesitated. The charter members of Upton Lodge were ten in number: E. F. Nickerson, R. A. Burget, R. M. Cole, P. A. Trotier, N. W. Mason, H. C. Bowen, C. D. Cole, A. G. Bliss, W. A. Pomeroy, and Thomas McClellan. Of this number, all have gone to "The Celestial Lodge above," except one, our dearly beloved friend and elder Brother, Richard A. Burget. He is our only "Henry Price fifty-year member, and it was our great pleasure, recently, to present him with a Henry Price medal. It seems to me, as I remember it — I was a boy of twelve or thirteen years of age — that my father was most instrumental in starting the Lodge. I can remember that he was anxious about it and questioned considerable as to whether Berkshire Lodge would allow Cheshire to get numbers enough to form a Lodge. My father was brought up in Adams and he and Daniel Upton had been friends from boyhood up. Daniel Upton was Master of Berkshire, District Deputy Grand Master, and later was Junior Grand Warden. It certainly was a great compliment to both Daniel Upton and to Berkshire Lodge to have a Lodge named "Upton." It is little wonder they allowed us to be born, nevertheless, we are thankful for the same. The relations between the two Lodges have always been most cordial and at times when our numbers have been small and we needed encouragement it has always been forthcoming. The first meeting was held June 8, 1869, fifty years ago tomorrow night, in the small hall of the old "Wolcott Tavern, which had been refitted and refurnished by Felix F. Peticler. Several joined the Lodge and they began to look for permanent quarters. None were available and "Mechanics Hall" so called, the present premises, was finally bought by twelve members. Considerable money was expended in repairs on the three floors of the building so that the original cost and all made a sum of about $7,500. Rent for some time paid the interest and something on the principal, but business reverses came all over the country, and it finally became necessary, as Worshipful Brother Burget expressed it, for the members to "bleed freely." Brother Burget and my father paid off an indebtedness at one time of over $3,000, and even that did not cover the whole of it. Those days are all past however and Upton Lodge is now on a firm financial footing. I remember the interest taken in the construction of the furniture of the Lodge by the amateur carpenters — this altar, these black and white rods, these pedestals; and I remember the day this gavel and the Senior and Junior Wardens' batons were turned. I remember, too, that they said they were going to be a little extravagant about one thing — they were going to have a "boughten" Marshal's baton — and here it is! The discussions, too, with reference to the admission of some of the candidates were earnest. Just why they did not keep all that from me I do not know. They did not seem to try very hard, or perhaps they did not know how very big my ears were. I shall never forget my father coming to me one day and saying, "Gene, what do you think of our taking ___ ____ into the Lodge?" "Well," I said, "his reputation is a little shady, but if your institution is a good one, you can occasionally take in one of those fellows and try to make a man of him. You don't want too many of them, however. They would swamp you." They made a pretty good man of him and after I came into the Lodge he was here and he was one of the best officers. In the beginning and for many years there was great opposition to Freemasonry in Cheshire, and I remember that when I was a boy and used to distribute the mail in the post office where my father was postmaster so many years, there were sixty copies of an anti-masonic newspaper taken in this little town. It seems almost incredible. Freemasonry has outlived its critics however, and its principles are now known to outsiders as well as members. We have had a few if any "high points," or notable occasions. It has been our privilege to attend many Masonic celebrations in different parts of the state and country, and we have had many, many, many a good time and profitable occasion here in our Masonic home. We have tried to make life easier and better for each other, and especially have we tried to make our young men see the best side of life and the best way to live it. The service flag above our heads with its stars speaks eloquently for them. This visitation of the Grand Lodge is the first regular one in our fifty years, although we cannot omit to mention the notable one of Most Worshipful Melvin M. Johnson and Right Worshipful William M. Farrington, when I was District Deputy Grand Master. Brother Johnson's conceptions of Masonry and his eloquent delineations made impressions which will last until time shall be no more. I wish to thank the Most Worshipful Grand Master for his ready acceptance of our invitation to come among us and I hope the stay of the Grand Officers will be as pleasant to them as we know it will be profitable to us. To all the members of the Grand Lodge, more than we expected or anticipated or deserved, we bid a hearty welcome. We hope you will experience so pleasant and enjoyable an occasion that you will not attempt to wait another fifty years before you visit us again. By Worshipful Zadoc G. Williams. And I do hereby appoint Bro. E. F. Nickerson to be the first Master, Bro. R. A. Burget to be the first Senior Warden and Bro. R. M. Cole to be the first Junior Warden of said Lodge, and it shall be the duty of said Master, Wardens and their associates and they are hereby required to return this Dispensation with correct transcript of all proceedings, and under the authority of the same together with an attested copy of their by-laws to our Grand Lodge aforesaid, at the expiration of the time herein specified, for examination and such further action in the premises as shall be deemed wise and proper, for the advancement of the general interest of the Craft. aforesaid this eleventh day of March, A.D. 1869. The first communication of the Lodge was held on June 8, 1869. The records do not state where it was held, but at this communication applications were received from Francis L. Jenks, Wm. R. Lane and George W. Fisher. At this meeting also a committee was appointed to procure a suitable hall for the use of the Lodge and it was voted to hold the regular communications the second Tuesday in each month. At the regular communication in July, 1869, it was resolved to use the By-Laws of Mystic Lodge while working under dispensation, the only changes being with reference to fees, dues and election of officers. The first degrees conferred by the Lodge were at the regular communication held August 10, 1869. From June 8, 1869, to May 10, 1870, regular communications were held each month and also during that time twenty-nine special communications were held, mostly for instruction and working degrees. Between May, 1870, and August 9, 1870, no regular communications were held, but there were five special communications. It is understood that the Lodge was named after Daniel Upton, who was District Deputy Grand Master at that time and instrumental in organizing the Lodge. He was one of the outstanding Masons in Berkshire County and was District Deputy Grand Master from 1869 to 1875. At a special communication held October 26, 1870, he presented the Lodge with a silver trowel. On July 26, 1870, a special communication of the Most Worshipful Grand Lodge was held at the Masonic Hall in Cheshire for the purpose of constituting Upton Lodge, installing its officers and dedicating its hall. Grand Officers present included Most Worshipful William Sewall Gardner, Grand Master, Right Worshipful Charles L. Woodbury, Deputy Grand Master, Right Worshipful Ithamar F. Conkey, Senior Grand Warden, Right Worshipful John McClellan, Grand Treasurer, Right Worshipful Solon Thornton, Grand Secretary, Worshipful Rev. Charles H. Titus, Grand Chaplain, Right Worshipful William G. Grammer, Grand Marshal, and Daniel Upton, District Deputy Grand Master of the Ninth Masonic District. Visitors were also present from Berkshire Lodge of South Adams and Mystic Lodge of Pittsfield. Upton Lodge was constituted in Ample Form, the officers were installed, the Charter presented and the hall was then dedicated. From 1890 to 1896 the activities of the Lodge seemed to be at a low ebb, as from the records often times there were only the first three officers and the Secretary present at the meetings. During that period only two members were admitted; since then, members have been admitted each year, with the exception of 1898, 1900 and 1932. The Lodge has had a total of two hundred and seven members and has at present seventy-six active members. Upton Lodge was most fortunate in having one of its members serve as Most Worshipful Grand Master of the Grand Lodge of Masons in Massachusetts — Herbert W. Dean. Brother Dean's application was received in the Lodge at the regular Communication November 10, 1896. He was elected and received his Entered Apprentice Degree December 8th, his Fellow Craft Degree on January 12, 1897, and his Master Mason Degree on March 9th. He was Junior Warden from December 14, 1897, to December 11, 1900; Senior Warden from December 11, 1900, to December 23, 1902; Worshipful Master from December 23, 1902 to December 24, 1904; District Deputy Grand Master of the 15th Masonic District, 1911-1912; Senior Grand Warden, 1922, and installed Grand Master in December, 1929. Masonry in Cheshire dates back considerably farther than 1869. To substantiate this, I have taken parts of an address given by Most Worshipful Brother Herbert W. Dean at the 125th anniversary of Mystic Lodge of Pittsfield in June, 1935. In 1767, men from the Colony of Rhode Island and direct descendants of the men who followed Roger Williams to Rhode Island, purchased a tract of land in a comparative wilderness. This was known as the New Providence Purchase and was situated on the crown of a hill which they called New Providence Hill, now known as Stafford Hill. A flourishing little village with taverns, stores, churches and dwellings came into being. Cheshire, as a Town, did not exist until 1793, when it was formed from sections of four towns, one of which was New Framingham, now known as Lanesborough. In 1794, twelve residents of Stafford Hill headed by Col. Jonathan Remington, petitioned the Grand Lodge for a dispensation to form a Masonic Lodge, with the privilege of meeting six months in Cheshire and six months in Lanesborough. It was voted by the Grand Lodge that they be indulged in the privilege of holding a Lodge in Cheshire, to be known as Franklin Lodge, and the other part of the prayer, insofar as meeting in Lanesborough, was incompatible with the principles which actuates the conduct and marks the proceedings of the Grand Lodge. This was the first Lodge chartered in Western Massachusetts after the union in 1792. Previous to this, there had been two chartered by the Massachusetts Grand Lodge — Berkshire in Lenox and Stockbridge in 1777, whose charter was recalled in 1784 for failure to pay Grand Lodge dues, and Friendship of Williamstown, chartered in July, 1785. Franklin Lodge continued to meet on Stafford Hill until June, 1800, when they again applied for permission to meet alternately three months in Cheshire and three months in Lane-borough. This time the request was granted and this procedure undoubtedly did much to increase the number of members from Lanesborough and vicinity. In 1804, Calvin Hall, a member of Franklin Lodge, built a fine tavern in what is now the village of Cheshire, on the main stage road between Boston and Troy. Shortly thereafter, Franklin Lodge moved its meeting place to a large room on the south side of this tavern. This room was elaborately decorated with Masonic emblems painted on the walls by some unknown artist. After their discovery in 1921, some of them were restored through the generosity of Mystic Lodge. By R. W. Frank S. Reynolds and Wor. Hollis J. Nuttall. One hundred years ago on March 11, 1869 Upton Lodge was granted a dispensation to form a Masonic Lodge by Most Worshipful William Sewall Gardner, Grand Master of Masons in Massachusetts. This dispensation was received through the efforts of twelve men who also chose the name of Upton Lodge in honor of Wor. Daniel Upton of Berkshire Lodge in South Adams. The first Master appointed by the Grand Master was Wor. E. F. Nickerson. The Lodge held its first Regular Communication on June 8, 1869. The place of meeting is not recorded but shortly afterward they found a "suitable hall". It is believed that this was the present building which was then called Mechanics Hall and shows on an 1876 map as "F. & A. M. Society". The Lodge had many applications for membership and raised 16 before the Charter was granted. At a Special Communication of Grand Lodge held at "Masonic Hall, Cheshire" on July 26, 1870, Most Worshipful William S. Gardner presented the Charter and dedicated the hall. The Lodge continued to thrive, adding about 40 Brethren to the rolls by 1890. At this time activity declined for three or four years. During this brief period attendance at times was three or four and demits and suspensions were noted. In 1894 activity picked up again apparently through the efforts of some of the Brethren to rectify the situation which had prevailed. The social life of the Lodge was apparently of greater importance than it is today because receptions and socials were held at which dancing, games and fine suppers were enjoyed. Another incident which is of great interest was the Past Masters Night in 1902 at which were presented not only the Past Masters of Upton Lodge but also those of Crescent Lodge of Pittsfield and those of Berkshire Lodge of Adams. This was truly a Fraternal gathering of 92 Brethren with Crescent Lodge working the Master Mason degree. A new organization in Cheshire appears in 1903 to join in the use of the Lodge rooms. Stafford Chapter, Order of Eastern Star, was organized and from this point on they added much to the welfare of the Lodge, providing many fine suppers as well as furnishing most of the furniture and other furnishings for the kitchen and Banquet Hall. With the advent of the Star, the Lodge fixed up and began renting the two back rooms under the Lodge rooms. Apparently the Lodge meeting room on the top floor was the only room used prior to this. Up until Jan. 9. 1912 the Lodge quarters were rented. At this time half of the property was purchased for $200 from Wor. R. A. Burget, one of the two owners, who were both members of Upton Lodge. The rest of the property was purchased from the other owner, Wor. H. C. Bowen, in September 1914 for $1200. The money for the purchase was borrowed and a mortgage taken out on the property. After eight years had passed Bro. Henry W. Haynes, son-in-law of Wor. R. A. Burget who was a charter member and the first Senior Warden, gave $300 and the Trustees and the Lodge each gave $100 to pay off the mortgage. The mortgage was burned at the communication of June 13, 1922 representing trustees. Officers and members respectively. Presiding at this important milestone in our history was Wor. Dorsey F. Ingalls who today is our second oldest member and oldest Past Master. Many members have faithfully and honorably served Upton Lodge in these past one hundred years. Seven Past Masters have also served as District Deputy Grand Masters. They are: R. W. William P. Martin, R. W. Eugene B. Bowen, R. W. Herbert W. Dean, R. W. Ralph L. Getman, R. W. Kenneth W. Chase, R. W. and Rev. Chandler M. Holmes, and R. W. Frank S. Reynolds. In addition to these honors, R.W. Herbert W. Dean served as Senior Grand Warden in 1922 and as Grand Master of Masons in Massachusetts in 1929, 1930 and 1931. He was instrumental in instituting the Lodges of Instruction in this Grand Jurisdiction. Among those Brethren serving as Officers for long periods were: Wor. R.V.B. Wood, Secretary for 35 years; succeeded by R. W. R. L. Getman who served for 7 years and was in turn succeeded by his son, Wor. D. Marhlon Getman, who served 17 years. Another father and son combination was Wor. Edgar W. Chase who was Treasurer for 23 years and was succeeded by his son, Wor. R. R. Chase, who held the office for 35 years. Other faithful Officers were: Bro. Lewis M. Newton, Tyler for 18 years and our present Chaplain, R. W. Chandler M. Holmes, who has held that office for 18 years. The 50th Anniversary was celebrated in 1915 with Grand Lodge Officers present as well as many area Brethren. After a supper, the history of Upton Lodge was read by R. W. E. B. Bowen and the Crescent Quartet sang several selections. A 70th Anniversary was celebrated at a Special Communication on June 13, 1939. Wor. R. R. Chase was presented the Joseph Warren Medal by the District Deputy Grand Master and Most Worshipful H. W. Dean spoke on the history of Upton Lodge and early Masonry in Cheshire. On June 9, 1945 a Special Communication celebrated the 75th Anniversary of the constitution of the Lodge in 1870. Most Worshipful Samuel H. Wragg and Suite were in attendance. After opening the Grand Lodge in the Lodge rooms, all retired to the Grand Hall where supper was served by Stafford Chapter, O. E. S. The Berkshire Quartet sang a few numbers and Wor. Zadoc G. Williams read the 75 year history of Upton Lodge. At this time R. W. Ralph L. Getman presented the Lodge a plaque bearing the names of Lodge members who had served in the Armed Forces in World War II. The Grand Master was then surprised by the presentation of a gift in honor of his birthday. The history of Upton Lodge has been full of dedicated Masons who were pillars of the Church, servants of the people and brothers to their fellow-men. The many eloquent resolutions, on the death of Brethren, which were spread on the records testify to the high esteem in which these men were held, not only in the Lodge but also in the community. May we endeavor to emulate these true Brethren so that when we are admitted to the Celestial Lodge Above, the Grand Architect of the Universe will be pleased to say "Well done, my good and faithful servant; thou hast surely walked a true and upright Mason". The challenge of the next 100 years is ahead. Freemasonry returned to Cheshire on March 11, 1869, when M. W. William Sewall Gardner issued a dispensation for Upton Lodge, named for Wor. Daniel Upton, a Past Master of Berkshire Lodge in Adams. The Grand Master appointed Wor. E. F. Nickerson as the first Master. The first meeting was held June 8 in a "suitable hall" (the assumption has been that it was Mechanics Hall). An 1876 town map indicates a "F. and A. M. Society." M. W. Herbert Harold Jaynes and Grand Lodge officers traveled to Cheshire on June 21, 1969, to celebrate Upton Lodge's 100th anniversary. In the history of that Lodge it is noted that Bro. Herbert W. Dean was elected Senior Grand Warden in 1922 and served as Grand Master 1929-31. He traveled to the Orient during his term of office and was instrumental in instituting the Lodges of Instruction in Massachusetts. M.W. Melvin Maynard Johnson visited Upton Lodge in 1915, and M.W. Samuel Holmes Wragg attended the 75th anniversary of the Lodge and presented a gift on his birthday. The Lodge has recently honored Wor. 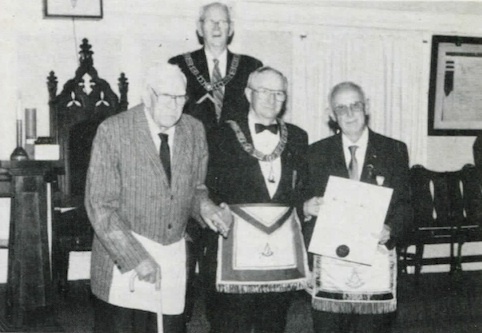 D. Marhlon Getman of Enfield, CT, once a resident of Cheshire, and he was given a certificate by Grand Lodge on the 50th anniversary of presiding in the East of the Lodge. Bro. John Rathbun of Cheshire was recognized for his 94 years of life and 69 years of faithful membership in the Craft. R.W. Allan H. Goodrich, D.D.G.M. of the 15th Masonic District, made the presentations. R. W. Allan H. Goodrich, D. D. G. M. of the North Adams 15th District, is flanked by Bro. John Rathbun and Wor. D. Marhlon Getman whom he honored in his visit to Upton Lodge, Cheshire. This page was last modified on 2 November 2016, at 07:42.